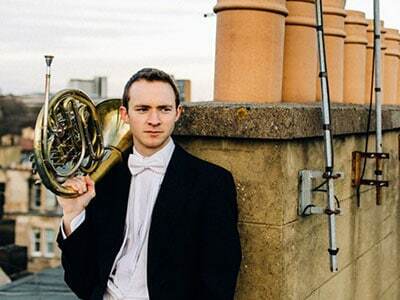 “A stunning performance… Alec Frank-Gemmill made the instrument dart, wail and flutter as if those were normal things for a French horn to do”. (The Herald) “I especially enjoyed Alec Frank-Gemmill’s cheeky handling of the runs and decorations in the Horn Concertino.” (Gramophone) “a wonderfully characterful account of Schumann’s Adagio and Allegro, with phrasing and tonal control so evocative that it made me sit up and take note.” (The Scotsman) Horn player Alec Frank-Gemmill is recognised internationally for the exceptional breadth and depth of his music-making. Principal Horn of the Scottish Chamber Orchestra, he divides his time between concertos, recitals, chamber music and orchestral playing. A proponent of the historical natural horn as well as of the modern instrument, his repertoire stretches from the baroque era to the latest contemporary compositions. Alec has appeared as soloist with the BBC Symphony Orchestra, BBC National Orchestra of Wales, BBC Philharmonic, Konzerthausorchester Berlin, the Düsseldorfer Symphoniker and Sinfonietta Köln. He also regularly performs concertos with the Scottish Chamber Orchestra. Highlights include the Ligeti Hamburg Concerto under Principal Conductor Robin Ticciati and Mozart’s Horn Concerto K. 417 on the natural horn directed by Richard Egarr. Alec’s recording of the Concertino for Horn by Weber released by Linn records has met with great critical acclaim. Artist in Residence at the 2013 Lammermuir Festival, Alec made his Wigmore Hall debut that same year. He has gone on to perform as a soloist in numerous festivals including Spitalfields, Ryedale, Mecklenburg-Vorpommern and St. Magnus. A regular at Open Chamber Music at Prussia Cove, Cornwall UK, Alec is highly sought-after to perform chamber music. His collaborators include pianist Alasdair Beatson and violinists Alexander Janiczek, Philippe Graffin and Pekka Kuusisto. A grant from Creative Scotland enabled Alec to develop his interest in historical performance. This culminated in a triumphant evening of baroque horn concertos in Shoreditch as part of the 2015 Spitalfields Summer Festival. Alec is also at the cutting edge in rediscovering not just instruments from the 18th but also the 19th century, such as the rotary-valve and piston horn. His debut recording for the BIS label showcases these instruments and will be released in March 2017. Alec appears at the Wigmore three times this season – in a solo recital, as part of a trio, and with the period instrument group Ensemble Marsyas. As a guest with various orchestras Alec can often be heard playing principal horn. He has performed this role frequently with the Royal Concertgebouw Orchestra, London Symphony Orchestra and Chamber Orchestra of Europe. Last summer he played for the first time with the Lucerne Festival Orchestra conducted by Bernard Haitink. Having himself studied in Cambridge, London and Berlin, Alec was recently appointed Professor of Horn at the Guildhall School of Music and Drama. His teachers have included Hugh Seenan, Radovan Vlatković and Marie-Luise Neunecker. Alec is the recipient of a Borletti-Buitoni Fellowship 2014 and is a member of the BBC New Generation Artists scheme.